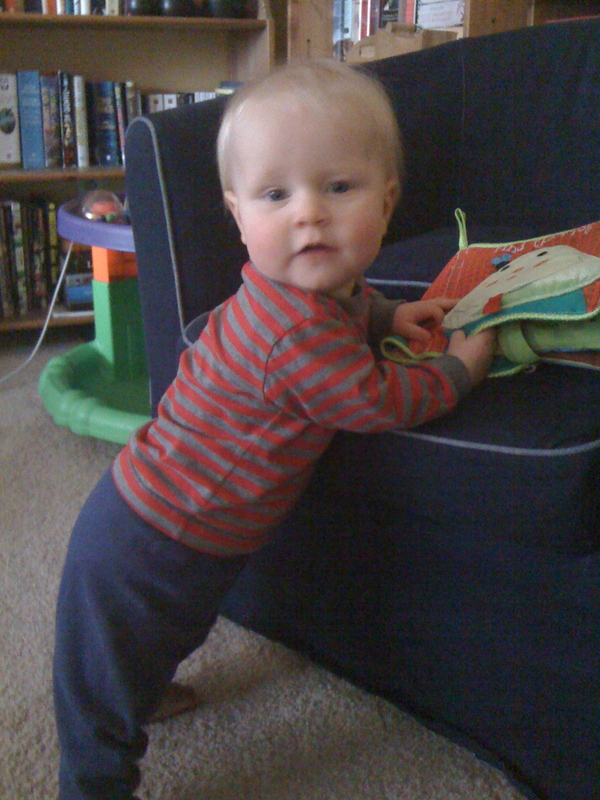 Today you are ten months old! You weigh 19.4 pounds and you are 29 inches long. You have eight teeth, that we know of. You are also the VERY BEST BABY that we know of. This has been an exciting month: you are so proficient at your army crawl that you have no need for regular crawling, it seems. You also like to stand up – with help. Maybe you will skip the classic crawl and go straight to walking. Today you ate rice and veggies (not pureed!) from your cowboy bowl sent from your Texas relatives. You like eating foods you can pick up, so delicately, with your thumb and index finger: cheerios, green peas, bits of carrot and cabbage, macaroni, peach, apple… Sometimes you get carried away and put too many pieces in there, and then cry a bit because you don’t know what to do – so we help you. You also like having a big chunk of apple that you can gnaw on – it’s exciting having teeth! I don’t care if it was completely accidental. It was real to me. In fact, one morning I went to change you out of your sleeper and lo and behold, there was a walnut still in there! (Shell on, obviously.) Poor little sweetie. We felt bad but couldn’t help laughing – and you’re such a good sport. The thing that’s been making us laugh the most is the way you figured out, all on your own, how to zerbert people. The first thing was Auntie Em’s leg, but today you created a veritable symphony on my stomach. It was simply awesome.